WASHINGTON — Senators on the policy panel on highways heard a familiar tune from three prominent transportation stakeholders Nov. 28. In short, the stakeholders told the members of the Environment and Public Works Committee: The country’s transportation network is desperately in need of long-term federal funding assurances meant to improve freight and commuter connectivity, the result of which could boost the economy. “We believe that it is now time for all transportation stakeholders, led by Congress and the president, to begin work on reauthorizing the FAST Act [2015 highway law] and to ensure a smooth transition to the next long-term bill without the need for disruptive extensions,” said Carlos Braceras, president of the American Association of State Highway and Transportation Officials. Braceras also is Utah Department of Transportation’s executive director. Corless suggested, for example, the adoption of a customized vehicle-miles-traveled fee as a possible alternative to the federal fuel tax. A few states, such as Oregon, are testing the alternative-funding method. Short-term infrastructure funding bills are common practice when Congress finds itself unable to advance a multiyear highway bill. The potential of construction delays for state highway projects is greater when federal allocations are disrupted. The leadership of the Environment and Public Works Committee, which acknowledged it had not considered a long-term infrastructure bill during the current Congress that coincided with President Trump’s tenure, again agreed with stakeholders’ call to action. During this lame-duck hearing of little legislative consequence, committee members debated VMT fees, highlighted the interest from cities and urban regions in public-private partnerships, emphasized a need to invest further in public transit systems and examined possible approaches for further streamlining federal environmental regulations. I’m encouraged by the bipartisan consensus on the need to invest in our infrastructure. Carper, who is one of the few members of Congress to suggest raising the Clinton-era 24.4-cents-per-gallon diesel tax and the 18.4-cents-per-gallon gas tax, expressed optimism that next year’s Democrat-led House and Republican-led Senate would achieve a long-term infrastructure bill. The incoming chairman of the House Transportation and Infrastructure Committee, Rep. Peter DeFazio (D-Ore.), said he shares Carper’s sentiment. Trump, and the leaders of the House and Senate, likely Speaker Nancy Pelosi (D-Calif.) and Majority Leader Mitch McConnell (R-Ky.), respectively, agreed infrastructure funding was policy capable of garnering bipartisan support when the next Congress convenes in January. Under Republican control, congressional leaders opted against a 10-year, $1.5 trillion infrastructure funding proposal the White House unveiled in February. The plan’s significant reliance on private-sector backing, which would have paved the way for additional tolling nationwide, was a deal breaker for most Democrats and key Republicans from rural states. High traffic volume, which is mostly absent from rural highways, is a requisite for tolling firms. 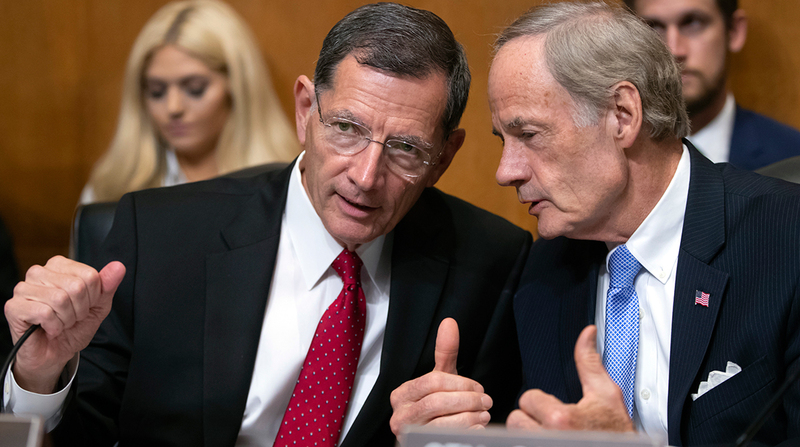 In the meantime, the current highway authorization law expires in 2020, presenting policymakers with a deadline to avoid disrupting federal infrastructure funds. Concerns about the federal government’s ability to consistently guarantee multiyear infrastructure funding led more than half of the states to increase their taxes on gas and diesel fuel in recent years.